Our trek starts at the Corso Italiano on St. Clair West. By foot, streetcar and subway we hop, skip and jump cross-town to St. James Park. 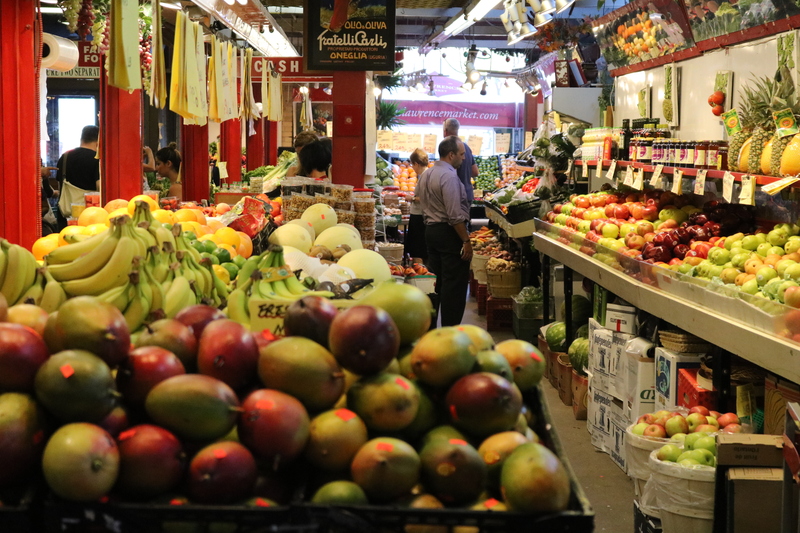 It’s downtown Toronto just a few blocks east of Yonge Street and a nudge north of St. Lawrence Market and the Gardiner Expressway’s endless dump of traffic into the city’s core. It’s hot – the still, heavy air is withering but it doesn’t dampen our anticipation. 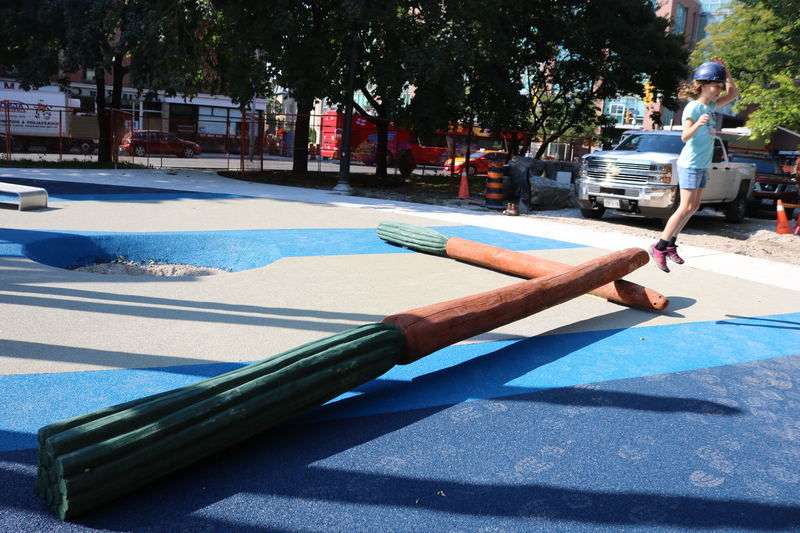 Behind orange barricades, my daughter Nellie-Rose and I eyeball the new playscape still under construction. Alex Waffle from Earthscape brings us in behind the fencing. After donning our hardhats, we waste no time. Nellie dives right into play-test mode. I try and keep up with her while shooting a few frames. A massive, empty cake cone plonked on its side invites discovery. In front of it, melting mounds of oozing chocolate, pistachio and vanilla ice cream. All food related elements are mega-mega. 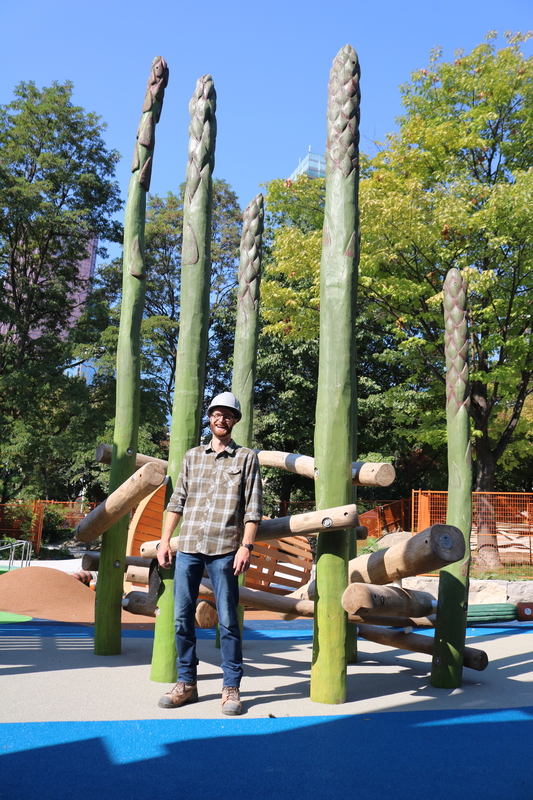 Asparagus stalks like towering totems with tips that look ready to munch serve as supports for staggered balance beams on varying inclines. The scale of it all. How many adventurous sprites will try and shinny to the top? Stretch carrots form a tip to tip ‘V’ hugging the ground ready to be scampered across, emphasizing that vitamin A’s veggie queen can help keep kids sharp and healthy in more ways than one. It’s produce from the tables of giants, the kind that Jack would bring back down from his Beanstalk adventures, or that Sophie’s Big Friendly Giant might add to a pot of stew. Stacked crates with stenciled markings dwarf us of mere human size. The crates anchor a slide and a rope bridge. On this visit, prior to the public opening, access is blocked but there is the promise of fresh berries. 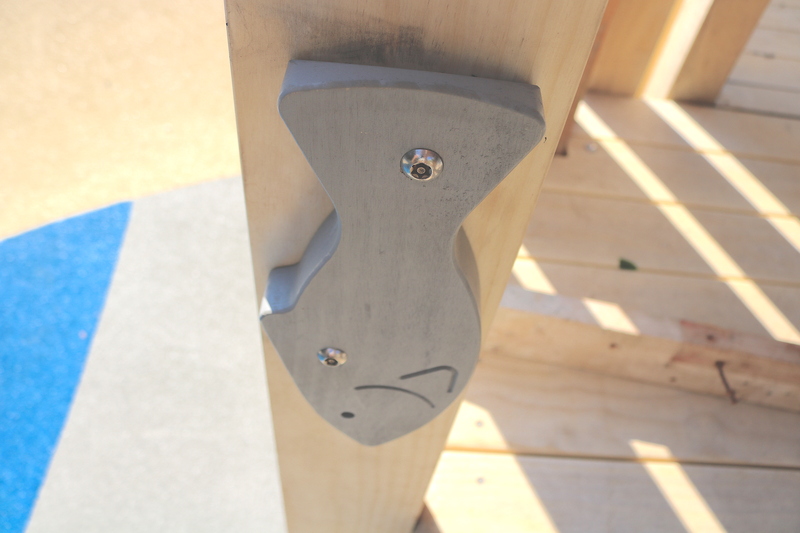 At the rope bridge’s other terminus is a shelter proclaiming ‘FISH’ sporting a double side-by-side slide. Fish are attached to the shelter’s vertical columns serving as decoration and a climbing aid. Beveled tails allow for little fingers to get in behind, grab on tight and pull up. Just beyond the fish monger, weathered pilings evoke the old piers and docklands where some of the St. Lawrence Market goods arrived by lake in earlier times. 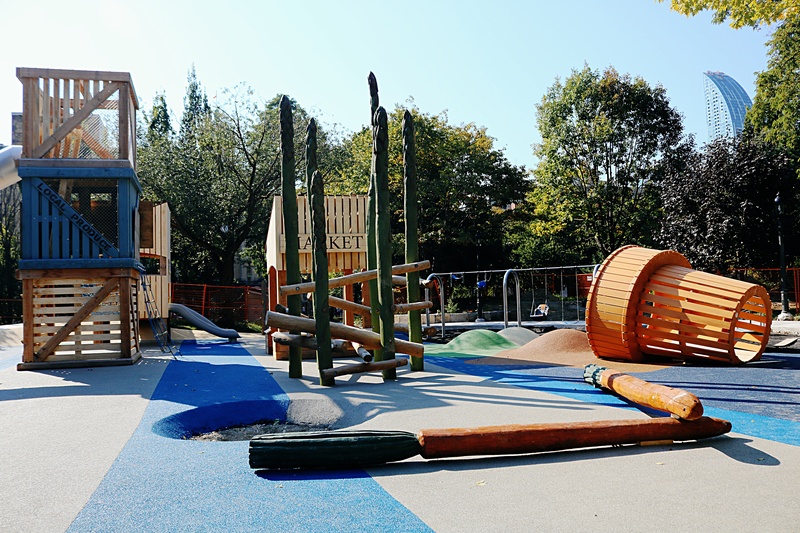 Ladies and gentlemen, another play zone where Nellie is only too happy to let loose. 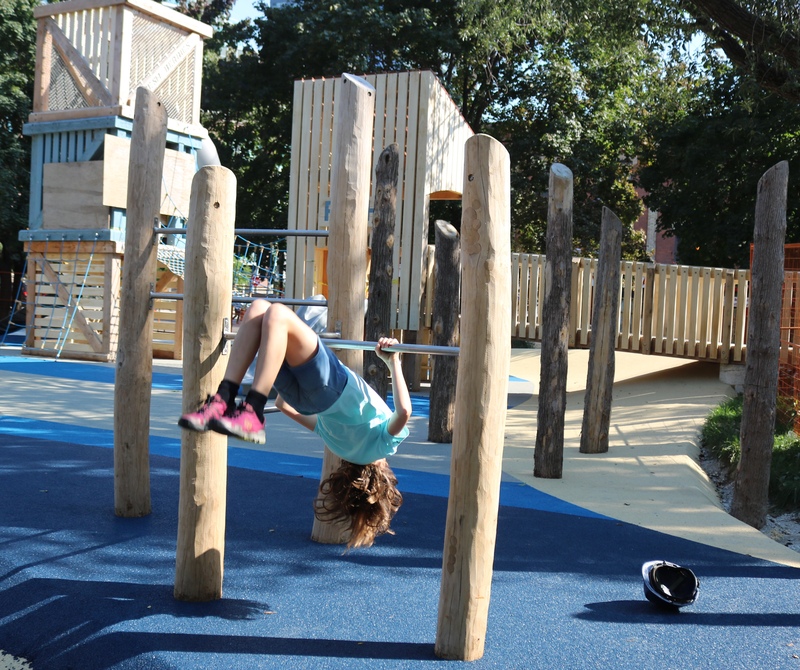 Doffing her cool yet constraining construction helmet, Nellie limbers up with 360° rolls on the bar – round and round, over and under, one big shock of hair nearly sweeping the ground. I’m starting to get dizzy watching her. Her upper body strength and sense of balance developed at circus school give her confidence making it all look easy. 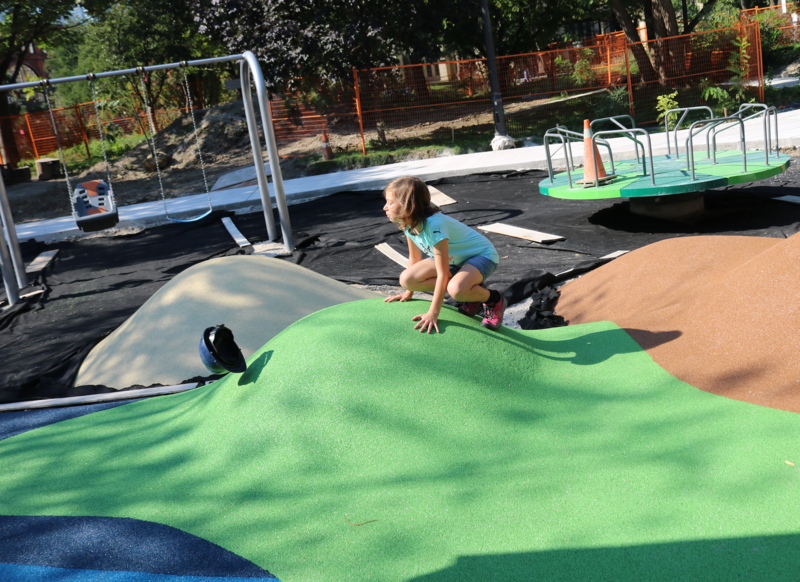 The bars and the ice cream bounce are at the top of Nellie’s list of highlights but we aren’t able to give everything a whirl as the playscape is not yet at 100% completion. There, in the near distance still not quite ready to zip is something we’d both like to put through its paces. The roundabout brings a smile. 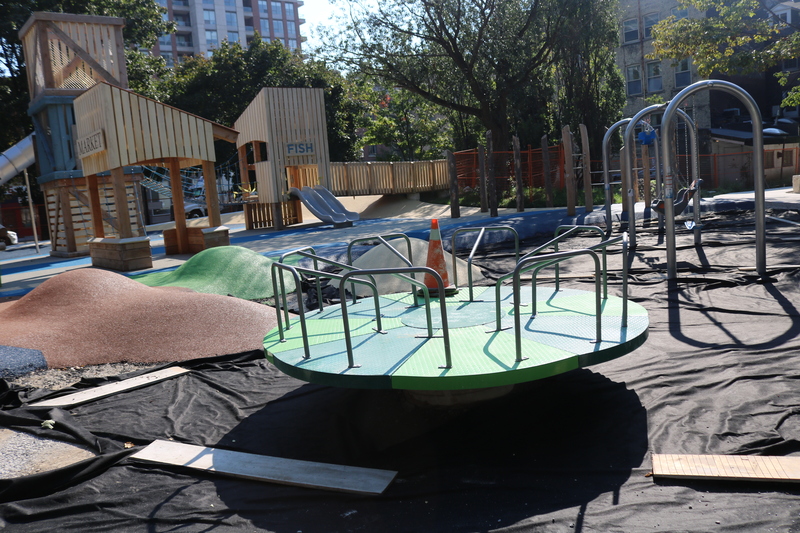 In our Nova Scotia home – and many other parts of North America – the once common roundabout , or merry-go-round – is on the endangered list. Most of them have been hauled out of their native playground habitat as a misguided safety measure. We’ll be back to ride this eight station g-force popper on a subsequent TO visit. I can almost feel the sweet dizziness of it now. Hats off to the municipality for giving the green light to this virtuous circle of spin and to Earthscape for a deft design touch. Kids, hold on and get acquainted with the wheel of fun. Heading to the main gate, we thank Alex Waffle for a great behind the scenes visit. Kids, when you want to play with your food, get your folks to bring you on down to St. James Park. We say goodbye to this foodalicious play spot knowing we’ll be back on our next visit with the grandkids in tow. 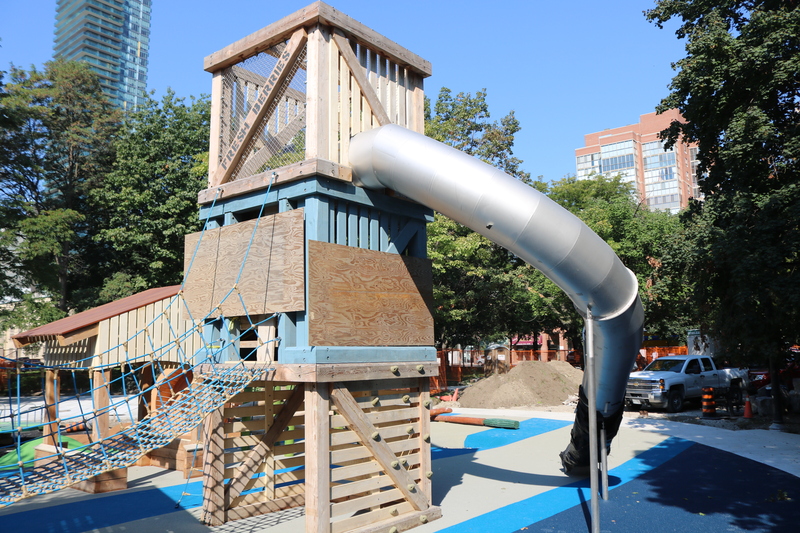 Thanks to Nellie-Rose my inveterate player-tester for all these years in playgrounds, campsites and backyards throughout eastern Canada. For our daredevil girl it’s a two thumbs up day even if the construction helmet sometimes seems to have a life of its own. Nellie and I both need to grab a bite. Alex’s last name inspires us as we search out a brunch spot. Le Petit Déjeuner on King St. East – a quarter million eggs since 2002 – calls out to us. Nellie goes for Belgian waffles with a swirly tower pf whipped cream – mmmmmmm…. or as they say in Québec miam, miam. Before we head back uptown, we hit the market – literally a three minute walk away through the fragrant gardens in St James Park. Bounty, everywhere. Outside the South Building, Nellie spies a stall with silver jewelry. Everything is made from recycled silver extracted from various sources. She chooses a a fine chain and a small medallion, a gift for maman. Thanks Mélanie – you made it possible for the two of us to adventure this day. 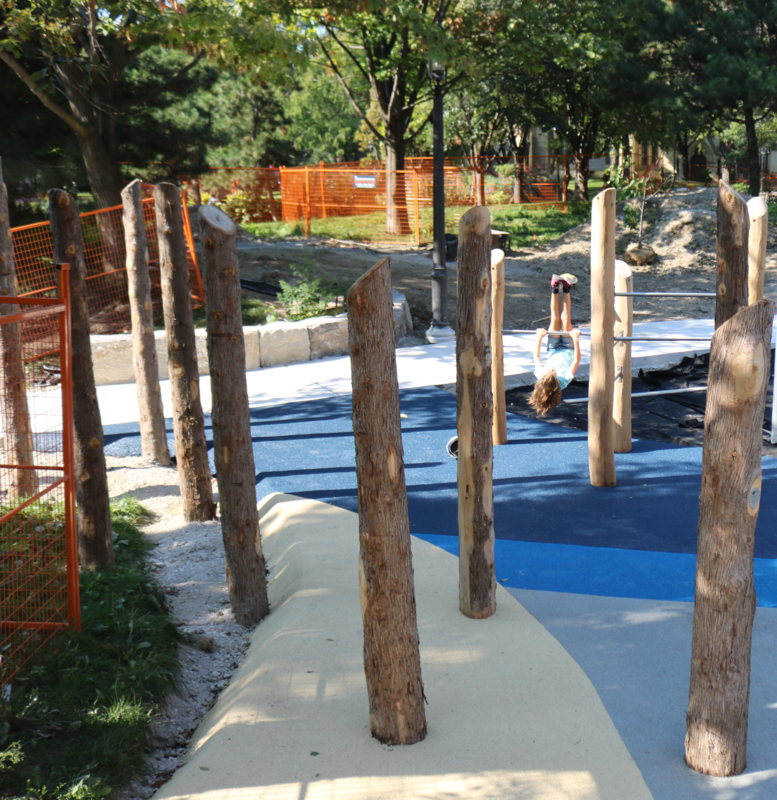 St. James Park Playscape – design and build by Earthscape with PMA Landscape Architects as project landscape architects. 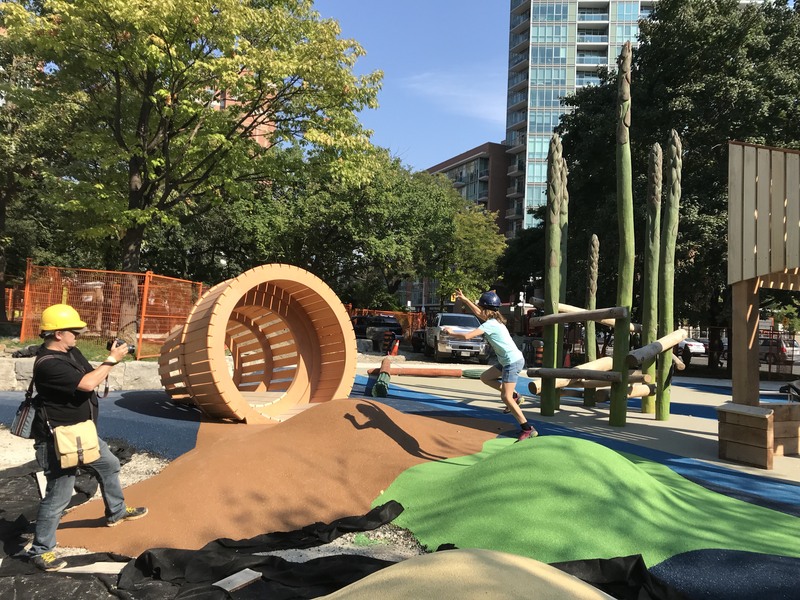 Thanks Earthscape Alex what a great host and a huge shout out to the Earthscape family who know a thing or two about creating award-winning public play spaces for kids.